One of my favorite parts of the event design process is finding unique and creative ways to incorporate branding into the design. From neon signs to custom build backdrops and logos made of floral we find a way to make branding stand out. Our process with corporate event design is to sit down with our clients and truly understand the brand, the aesthetics that represents the brand, and the overall marketing strategy for the current quarter or year. We look at everything including the current marketing campaign, office design, website design and any other materials our clients can give us. These conversations set the foundations for the event design so we can make sure the live event pairs up perfectly with the brand. 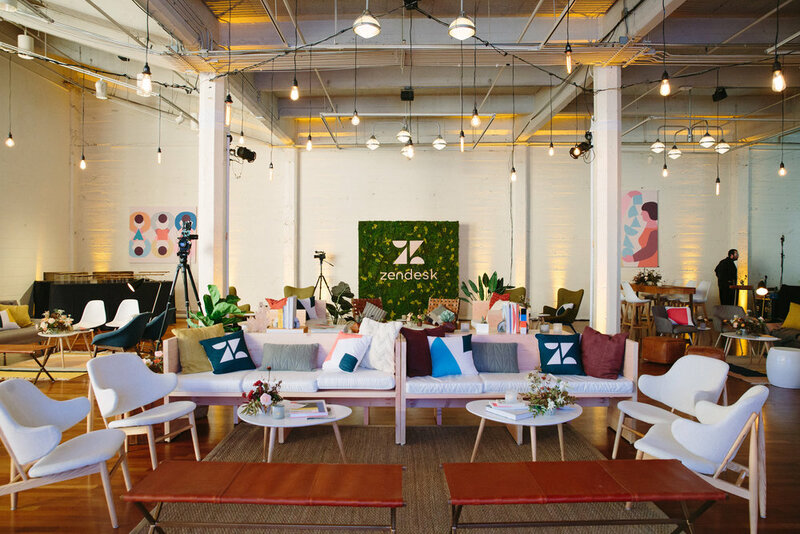 There are many ways and areas to incorporate branding elements into event design. This week we will go over three areas: 1) The Entrance 2) Logo 3) Photo Activation. Next week I will talk about how we incorporate branding into specific event design elements . 1) Entrance - The first thing guests see should be eye catching, relevant and fits into the overall event design because this element sets the tone for the event. It also tends to be one of the main items guests will photograph so you need the design and fabrication quality to be on point. 2) Logo placement - who is the event for is the first question everyone will ask when they walk into an event. Hopefully, if they are invited they know but it does not hurt to remind them. At least one logo element should be included in each event, otherwise the event has no company marker and it really could be for anyone. The inclusion of a logo should be done in a way that draws the guests eye the minute they enter the space. This creates a central focal in the space and gives an easy branded angle for event photos which, depending on the client can be just as important as the event itself. Some clients want their logo everywhere and others want a more subtle approach. I have included examples of each type of event below. Hulu Lounge at the ATX Television Festival. Custom built step and repeat with real plants. Next week we will dive into custom fabrication and designing unique event centerpieces!